Interesting read. I wish that people would have saved the evidence. I would like to be able to prove this. If Queen Victoria's diaries had not been burned by her daughter upon her death, we would know if it were true. However, if the possibility I present is the truth, then it is best for Britain at that time, for the truth to remain 'unknown'. I fail to grasp why they go to such effort to hide it now. It's history. I cannot imagine why it would topple the current queen. Was it the Tutor in that accounting? That would fit the timing as well, for the tutor died two weeks later. 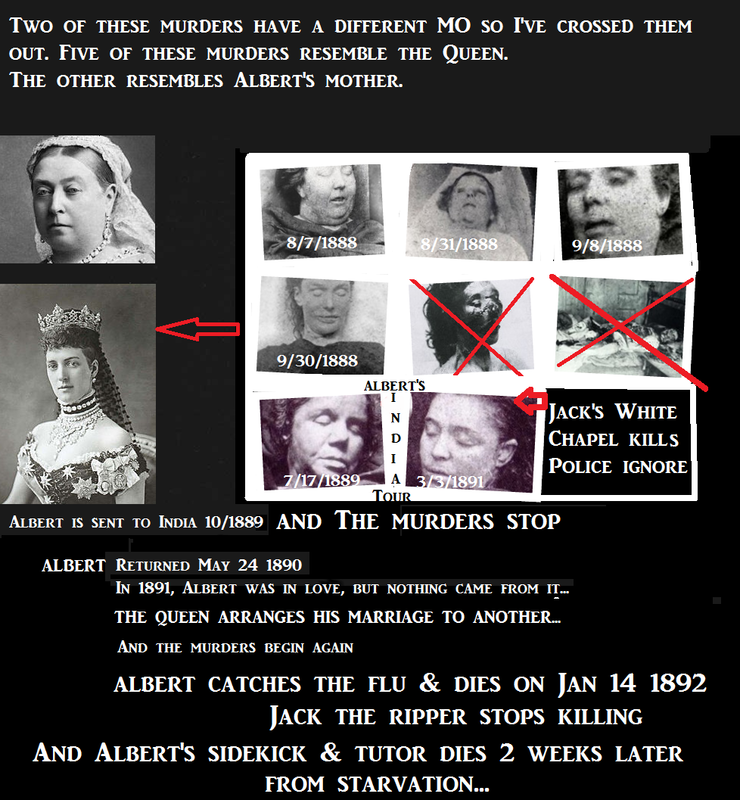 While the tutor would have less reason to kill than Albert, there were implications the two were lovers, so it's possible he could be driven to kill women of the street who had the misfortune to resemble the Queen, or Albert's mother who would berate his lover. But I'm thinking it's Albert because those who protected the Queen would have had no issues with killing the tutor the moment they realized he was the problem, but if it was Albert, the future King of England, removing him had to be a painful, reluctant order that is worthy of justifies the continued efforts to hide the truth a 100 years later. It also gives her a far greater reason why she was so angry at her first son and vowed to outlive him so he could never be king. The 'Albert died after see you' reason never made sense to me.